Int/Natl CH Merganser's Google CGC is a third generation product of our breeding program. She is our resident beauty queen. Google received International and National Show Champion titles as well as a Canine Good Citizens Certificate in 2009. Google received a Conformation Certificate at the 2007 National Labrador Specialty Show. 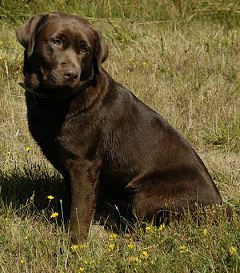 Google exhibits the classic broad Labrador head, stocky build, thick medium chocolate coat, and otter tail. She is a loving mellow house dog as well as a nice retriever. Google's pedigree is 1/4 field and 3/4 show. Super Charger VI is out of (NFC-AFC Candlewood's Super Tanker X FC-AFC-CNFC-CAFC Chena River No Surprise). Merganser's Special Delivery is a littermate sister to FC-AFC Fire-N-Ice's Whistlin Dixie. Am/Mex/Int CH Cook's Midnight Bandit MH is one of the few Labradors with both a show and Master Hunter title. Am/Int CH Tabatha's Gingerbread Cutter CD, JH, WC, CGC was the #1 Show Labrador in the USA in 1996 as well as winning 7 Specialty Show Wins, a Labrador record. Google has been spayed and is living a life of leisure as a full time house dog with Vickie Brutke in Grants Pass, OR. Google's lines continue in our breeding program with her son, Int/Nat CH Merganser's Go Daddy JH and her daughter, Int/Nat CH Merganser's Bing.